The modern day railway traveller will inevitably, at some point, have to make a change at Reading Station. Much the same has taken place here throughout history. The town has been an important junction for all modes of transport. At first it was simply the river and the ancient roads, but later came the Kennet and Avon Canal that opened up the route to Bristol. This was followed by several turnpikes each providing faster travel between towns, and then came the railways and finally the M4 motorway. There has been a settlement here since the eighth century when it was known as Readingum and the name is believed to derive from the Anglo Saxon for “Readdas People”. Reading Abbey was founded in 1121 by Henry I, who was later buried there. The abbey was situated at the confluence of the river Thames and River Kennet. During medieval times Reading Abbey was an important ecclesiastical centre and became one of the pilgrimage centres of England. During the peak of its fame it housed over 230 religious relics, including the hand of Saint James. Reading became an important centre for the manufacture of cloth in the 16th century and became very wealthy as a consequence. The Civil War brought an end to all that prosperity with the town changing hands a number of times during the hostilities. Excessive taxes were levied on the town by both sides when they were in possession, and it was a long time before the Borough could recover. Who can tell me the last time England was successfully invaded by foreign forces? The first answer many people will give is 1066, but some will point to Bonnie Prince Charlie who reached as far south as Derby in 1645. The correct answer is the “Glorious Revolution” of 1688, and the only significant fighting of that campaign was at the Battle of Reading on 9th December 1688. James II had come to the throne in 1685, and immediately seemed to set his sights on becoming our most unpopular King. As we have already seen, there has been considerable competition for this title throughout our history. James’ Catholic policy was certainly helping him on his way, and several of the “great and good” invited the Dutch William, who was married to James’ daughter Mary to come and deliver England from the perceived tyranny of their King. William landed at Torbay with his army on November 5th 1688, and marched through the West Country towards London to claim the crown. Such was the unpopularity of James that all opposition to the Dutch invaders melted away, and a conference was hastily arranged for James to meet William at Hungerford. James had sent a detachment of troops to Reading as an advanced guard. By this time James had become so mistrusting of his people that these trusted guards were all Irish Catholics. The people of Reading did not like this at all, and feared that the royal guard would ransack the town and kill the inhabitants. They sent an urgent message to William to come at once to their rescue. William immediately responded by sending two hundred and fifty soldiers to Reading. Upon reaching the town their ranks were swollen by many of the local men, and together they drove the King’s guard from the town. In the process the rebel forces suffered only five fatalities compared to fifty of the King’s men. William and Mary continued on their route to London, while James fled to exile in France. So it was that the “Glorious Revolution” returned England to Protestant rule and placed William and Mary on the throne. Reading has also been strongly associated with the brewing industry. In particular the brewery founded in 1785 by William Blackwall Simonds. Simonds developed his business and in the process became the beer supplier to the army barracks at nearby Aldershot. He later expanded his operations to Malta and Gibraltar in order to keep those garrisons well watered. In 1830 the brewery exported bottled beer to the army in India, and India Pale Ale (IPA) came into being. The brewery was taken over by Courage in 1960. The site of the original Simonds brewery is now occupied by the Oracle shopping centre. Reading was also at one time the world’s largest manufacturer of biscuits. For this we must go back to 1822 when the Crown Inn was a major coaching inn on the London to Bristol route. Opposite the Crown was a small bakery and confectioners owned by one Joseph Huntley. The coach passengers would visit his shop to purchase snacks for the journey. Huntley’s most popular product was his biscuits, but they had an unfortunate habit of breaking during the bumpy journey. In one of those flashes of brilliance received by very few people, he started supplying his biscuits packaged in a protective tin. Not just any old tin, but a hand-painted tin of quality that people would want to keep and re-use. Hence Mr.Huntley cornered the market in biscuits. Later, in 1838 he went into partnership with George Palmer, who set up the distribution side of the business selling the products throughout the British Empire. At its peak in the early 1900’s Huntley and Palmer employed over 5,000 people at its Reading factory. Sadly, the factory is now closed. In common with Oxford, the Thames only touches Reading at the edges. Most of the borough sits on the River Kennet, and the next major feature is “Horseshoe Bridge” that takes the towpath over the mouth of the Kennet. This bridge takes the award for the worst bridge I have seen so far on my journey. 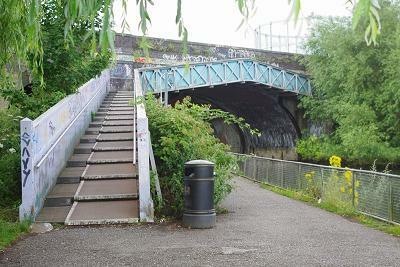 It a graffiti-strewn eyesore and is in complete contrast to the rest of the well-kept pathway through Reading. The only good thing about it is that it leads me into open meadows again for the walk downstream to the quaint village of Sonning.